The real value of climbing plants is that they provide the best value for the amount of garden they take up. Even in a small garden you can plant a climber that will provide a combination of flowers, foliage, and some even fruit, without sacrificing valuable space. Used to cover walls, arches, obelisks and trellis, they can also be great for covering up fences, and some can also be allowed to climb through trees and shrubs. So if you want to give your garden a lift, look for a climber that will suit your garden and your zone. Even when it comes to flowers, some are large, such as the hybrid clematis, while others such as Topaeoleum tricolor are tiny. So explore the world of climbing plants. Climbing plants can be used to cover fences, to act as screens or simply to add color to the garden with wonderful flowers or textured foliage. Some will attach themselves to the fence, others will need wires or some other form of suppoert. 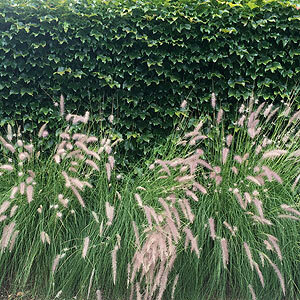 Try planting a low growing ornamental grass in the forefront to add extra interest. Arches and obelisks are often constructed purely to provide a growing frame for specific climbing plants. And if you wish to take this the extreme then take a look at the Wisteria tunnels in Japan. Of course climbers are also great for small spaces, they can be trained to cover a wall and give a 'green room' effect to a small courtyard without losing valuable outdoor space. Climbing plants range from slow growing to fast or vigorous growers and include both evergreen and deciduous plants. Some are useful, and other can become invasive. 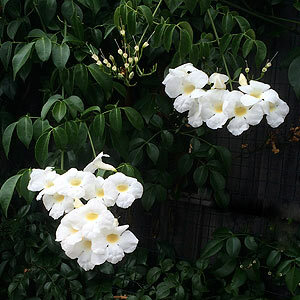 Here we list some of the best, easiast and the most beautiful climbing plants. We do know it is not easy, however the waxy bells are beautiful. Mnay varieties, some hardy, most with very attractive flowers some as big as dinner plates. Not really a Jasmine at all, however Trachelospermum jasminoides is evergreen, long flowering, fragrant and it gets into our list becuase it is so easy as well. It flowers in the colder months and is about as colorful as you can get. 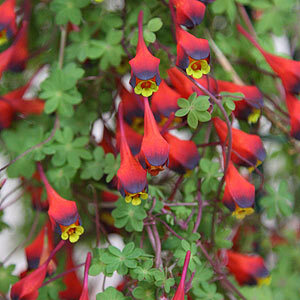 Small growing it is well suited to containers, or even a hanging basket.